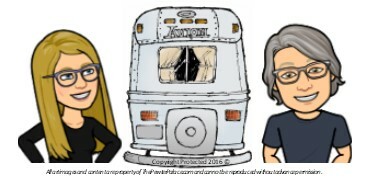 Use this link to get more information on taking a fabulous online 14 segment course on epic RV trip planning. Don’t have an RV? The tips, resources, methods in making sure your trip is planned smoothly, safely and to the maximum enjoyment is all here too! I plan to use the same techniques, tech tools , etc. to plan our future fly/drive/hotel vacations in the USA and abroad! Kevin and I highly recommend this course. We learned tons and want to share it with others in a meaningful way. We have offered to promote it from the originators of the course, Courtney & Steve Alcock of A Streamin Life who are full time Airstreamers and have become online friends of ours over the past years. We do receive a small referral fee from anyone who uses our link to register for the course. Those funds go simply to allow us to maintain our wordpress blog annually so we can continue to post our renovations, restorations and travels with our 1973 Avion-The Pewter Palace.